Not much from me last week because on Friday I woke up with a stiff neck. Well, that is painful but nothing a good pain killer couldn’t set right, I thought. I survived Friday at work pretty well in retrospective but it got progressively worse from there on. By Saturday night I was in such agony that I was wondering if I shouldn’t go to the emergency room if only for some painkillers straight away. I wasn’t able to lie down and couldn’t sleep. Sunday morning brought a little bit of relaxation but then it got worse again. Sunday evening I was in the hospital. The doctor didn’t take much of a look, said it was a stiff neck, gave me pain killers and some muscle relaxan and said if I would take one of those pills, that would knock me out for at least four hours, time enough to sleep and relax those muscles at least that far that I could sleep the rest of the night too. At 4 a.m., three painkillers and both of those relexan pills later I was still sitting as I couldn’t lie down and was close to crying because I was super tired but couldn’t sleep because of the pain. Somehow I must have managed to fall asleep but 3 hours later it was more than obvious I couldn’t go to work and seriously needed to see a doctor. And here finally someone took me serious. The doctor too took it for a stiff neck but she said that the only thing that would get you out of pain was relaxing those rock hard muscles. It got progressively better from there. A mixture of pain killers and heat got me moving again. Today I’m still not completely ok but last night I actually even slept well. Yeah! Why am I writing this in a Yarn along post you might ask. Well first of all because I wanted to complain a little and then because during my time of limited movements I spend a whole lot of time on the sofa knitting because knitting didn’t enhace the pain and if I kept my head motionless it was even nearly painfree. But I needed something fairly simple to keep me occupied so I started a pair of socks and finished it. I think I chose those bright colours to cheer me up. I had to cheat a bit and add some extra stripes because otherwise I would have managed to work two socks out of one skein. 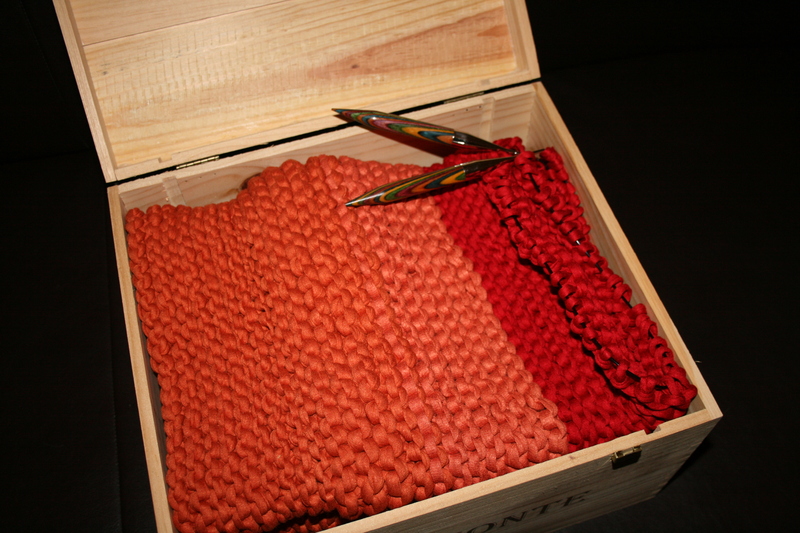 Can you see which parts don’t belong to the actual yarn colouring? 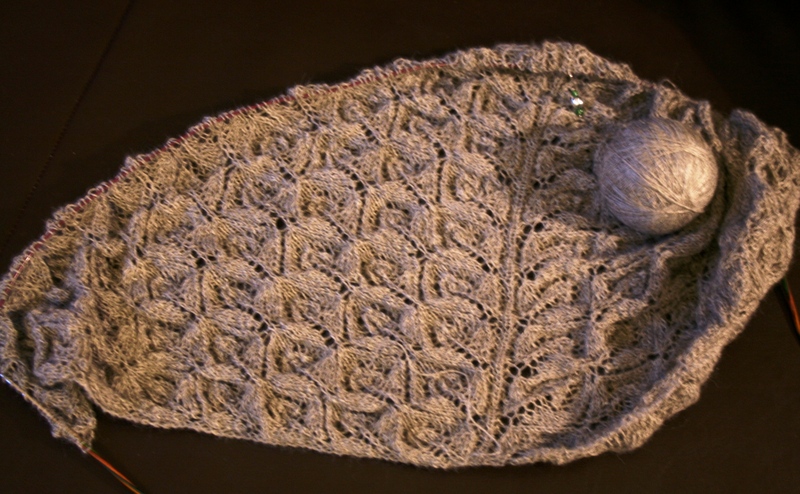 Than I knit a few more rows on my lace shawl. I know it will be beautiful. But it is growing so slowly. I manage to knit four rows in a row but not more. I’ve done the lace repeat that you can repeat as long as your shawl has grown to the size you want it so be now nearly three times. 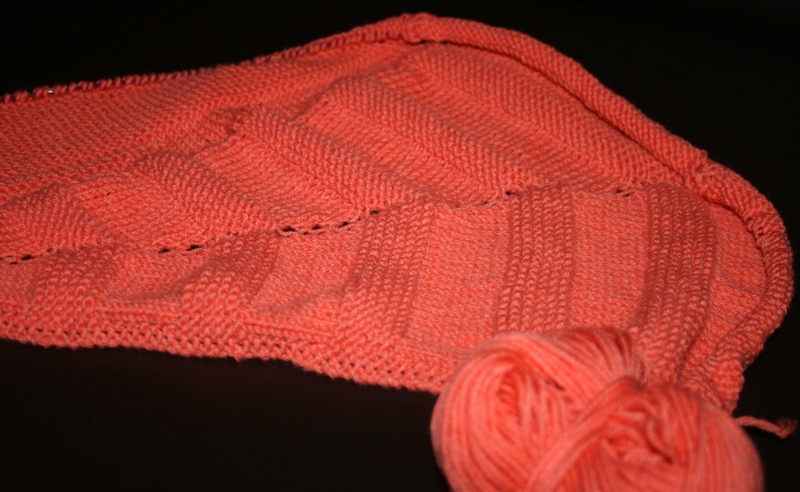 And I need to repeat it at least three or four more times before the shawl has a decent size. This could take another few months… Other than that I used the train ride on Wednesday and Thursday to add to my sweater sleeeve but to be honest, this knit didn’t thrill me much this week. And I finished clue 1 of my mystery knit. 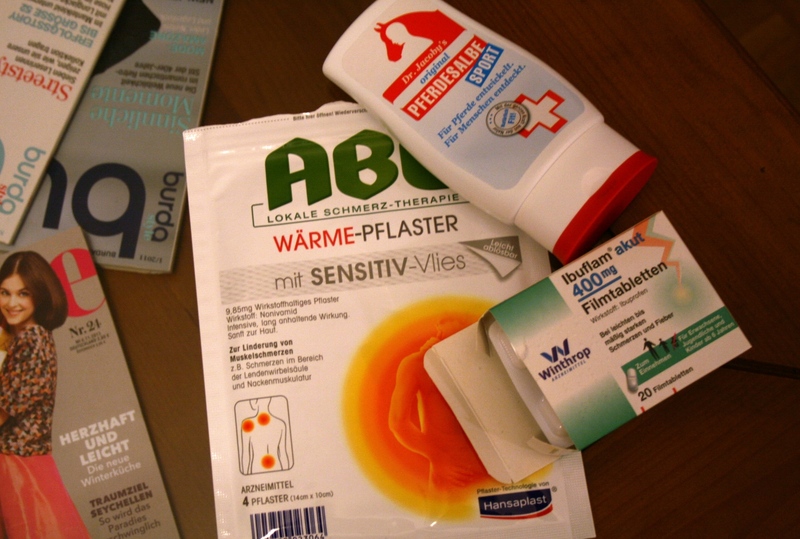 On monday I was nearly glad for being on sickleave. 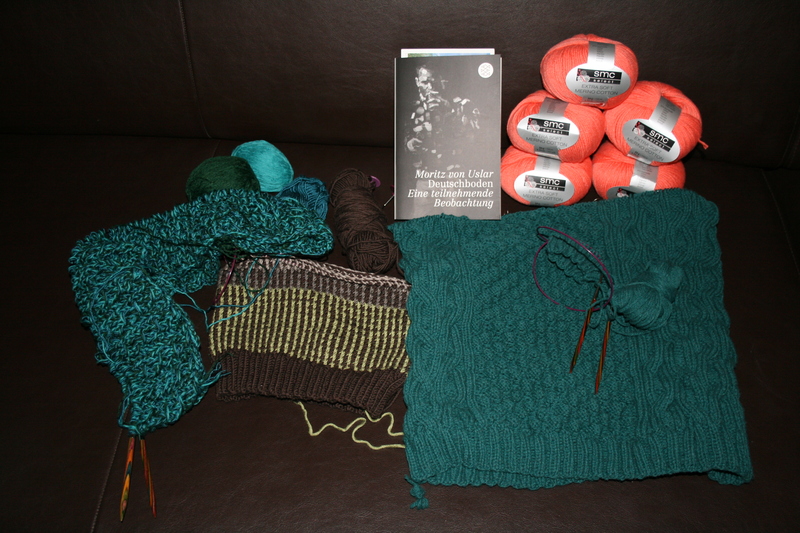 I was able to sit on the sofa and knit through clue 2 of the mystery KAL. It is weird. The form the knit has taken so far is more mysterious than really beautiful and I don’t like the colour that much. It is a really really bright coral. Yet when I wrapped it around my neck for the first time after finishing clue 2 last night, it did look good and the colour suits me. What more can you ask for? I’m curious what will happen in clue 3. As for reading I’m just finishing Mörderische Tage by Andreas Franz which is a crime story. Nothing much to write home about but good enough to follow through and started The Rosary Girls by Richard Montanari. This one is actually quite good if you like a bit psychopathic crime stories. After stating last week that I had three current projects and four hibernating ones AND wanted to join a Mystery KAL I thought I should finish something first before the KAL started on Monday. And so I did. Michael’s hat is quite nice for a completly made up pattern, I think. He wanted the hat to be slouchy but I guess he isn’t used to wearing a slouchy hat quite yet. But the wool is so soft so I guess he’ll get used to it. 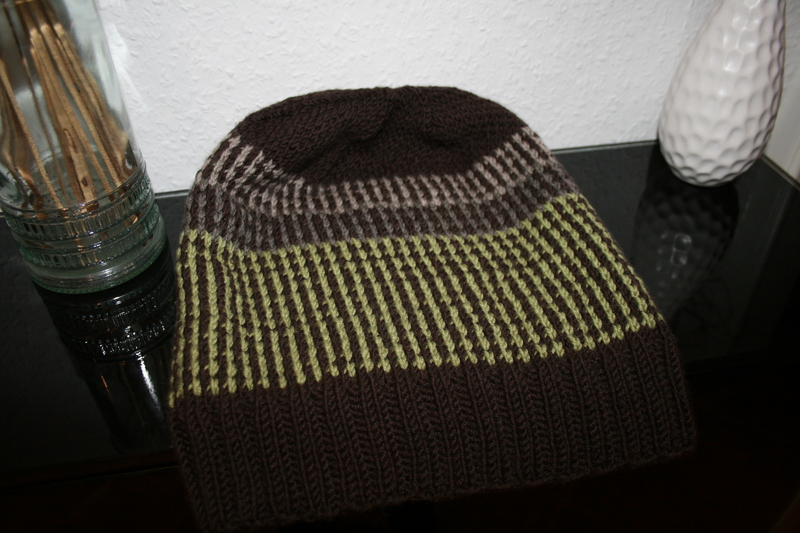 Next I finished the Stockholm Cowl. It would have been nicer had it been a little wider. But when you are stashbusting like me and mixing different yarns and run out of one colour than this determines the width of your cowl. But I’m pretty fine with it. I can wrap it around my neck three times and then it is pretty thick and cosy too. The person who’ll et it eventually will love it for sure. I also looked through my hibernating projects. I knit a hexipuff, something I haven’t done in months. And I packed a bag of short yarn left overs that could be turned into hexipuffs. Maybe some day I will even sew up some more of them and eventually this project will end up being a blanket. One day… Then I unpacked something that I fiercely started last January and after two or three weeks it went straight into hibernation: The carpet. Do you remember the carpet I started? Vaguely? So did I. I needed to search for it first because I had stored it away. Since I started I had bought far longer cables for my needles to I switched that first and then quickly knit up a hole skein of red. But I remember now why I stopped knitting that thing. It is quite exhausting with those super big needles and even now after I think three skeins the whole thing is already quite heavy. This means my poor wrists need to work a lot. I should get some wrist support bands or the like for the future. And I even knitted two rows on my lace shawl. Then I thought I could go back to my actual big project. By sunday night one sleeve was as good as done. I had tried it on several times so I should have taken the decision earlier but well, I didn’t. It was too tight. 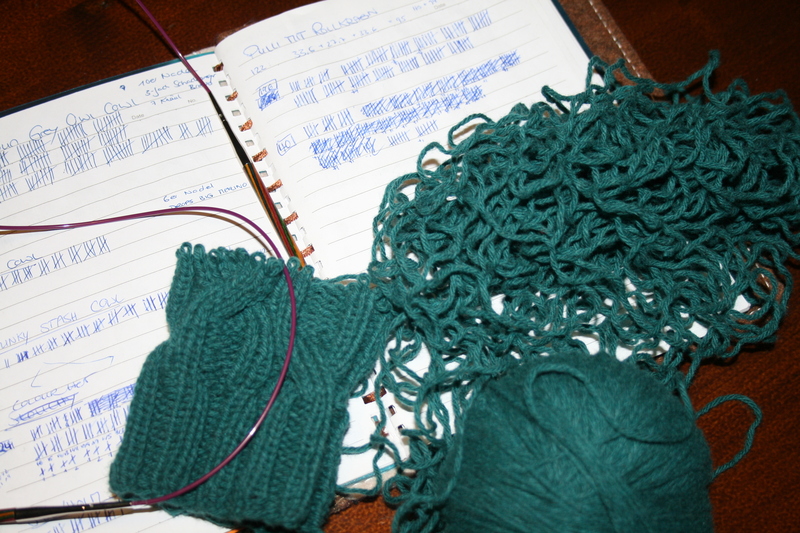 So I frogged two nights of work, about 100 rows. This was very depressing but I started new. About 30 rows later I checked it again and honestly, the way I increased and added stitches into the pattern just didn’t look good. And I want this sweater to be perfect (or at least the closest to perfect that I can manage). So last night I frogged it again. Now I’m nearly back to where I was last week but the sleeve is coming with me on my trip to Berlin the next two days and I guess even though I need to work a little on the train, I can spend at least one hour knitting on each trip so it will grow again. Last but not least the KAL. I started it. I even swatched. But I don’t need too much of a mystery so I checked the spoiler pics from people who already started on Monday and chose the version I’m following for clue no.1 after that. And again I was a bit over excited. I had repeated the pattern several times before I realised I repeated the four rows I was suppossed to repeat three times only two times. More frogging. More grmph feelings… But now I’m on track again. This, as you might have guessed, left little time for reading. So nothing new in this department. What about you? 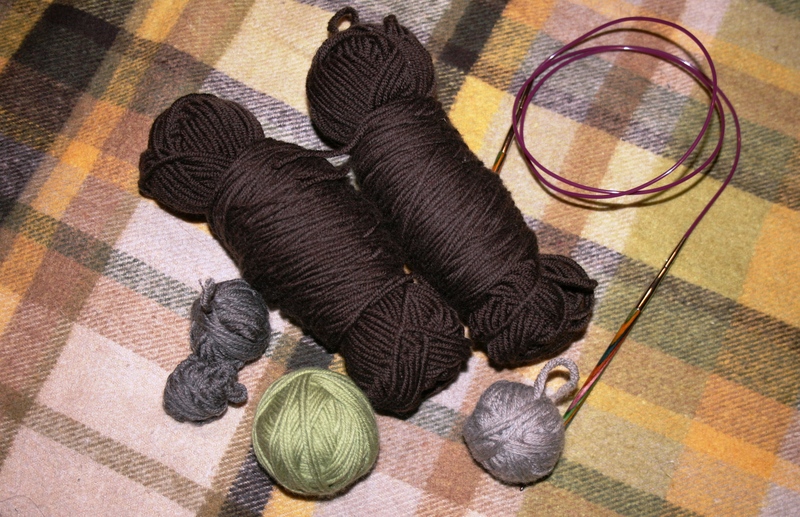 Linking up with Ginny and the Yarn along ladies as usual. 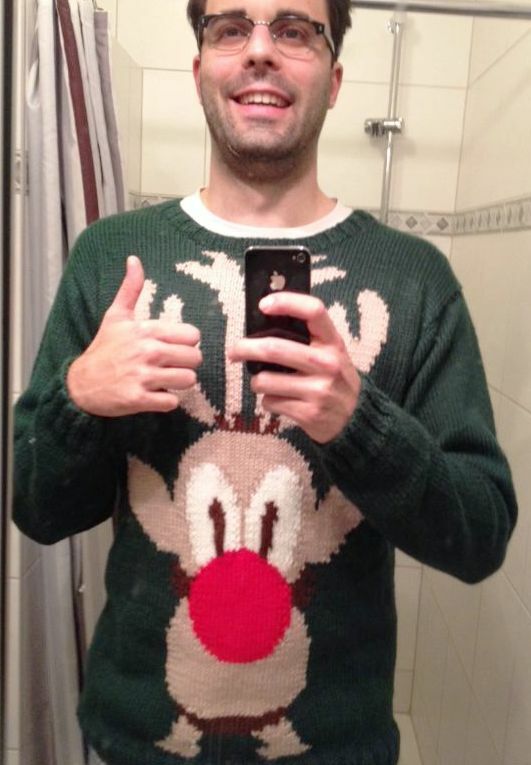 Yarn along – Week 51 – and the official christmas knitting is done! 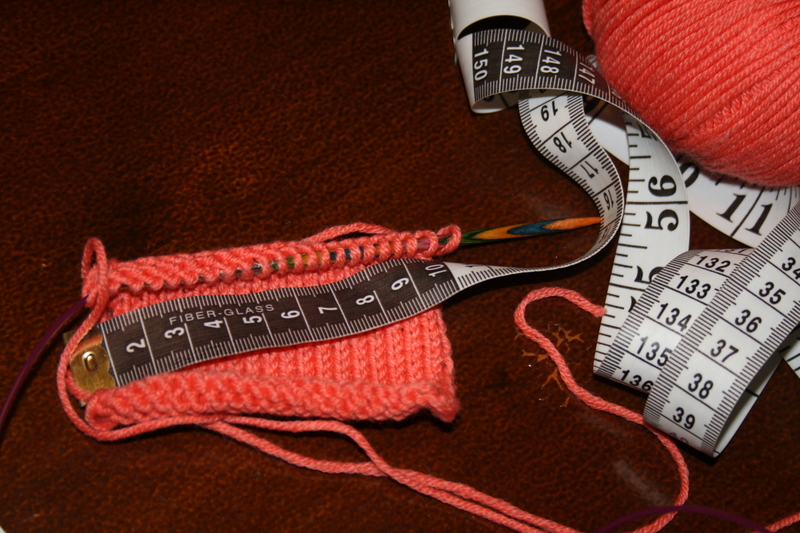 Yarn along – Week 49- it fits!